Tuti Patriots narrowly missed out on a playoff spot. Dindigul Dragons will take on Siechem Madurai Panthers in Qualifier 1 of the 2018 Sankar Cement-TNPL to be played at the ICL Sankar Nagar ground in Tirunelveli on Tuesday, Aug 7 (7.15 p.m.), after finishing as the top two teams respectively on the league points table. 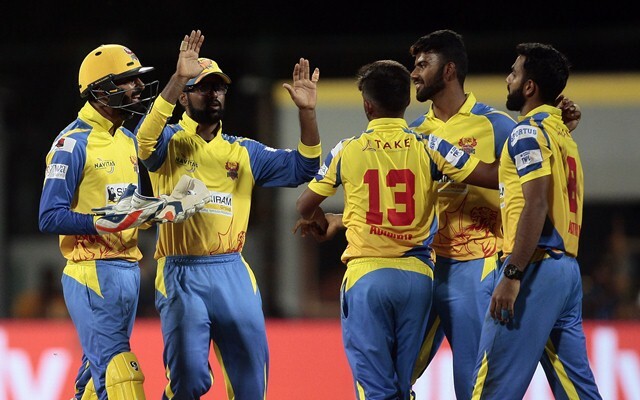 Lyca Kovai Kings and iDream Karaikudi Kaalai, who finished third and fourth respectively in the eight-team competition to make the cut for the Playoffs, will meet in the Eliminator to be played at the NPR College ground in Natham (Dindigul) on Wednesday, Aug 8 (7.15 p.m. start). The third edition will witness a new champion after inaugural winners Tuti Patriots and last year’s champions Chepauk Super Gillies failed to qualify. Tuti Patriots narrowly missed out on the spot the other night as they needed to chase the target of 164 runs in 18.4 overs. Instead, they gunned it down with only 4 balls to spare despite the fact that their star player R Sathish was in the middle and remained unbeaten on 57. Their opponents were benefitted with it and they qualified for the playoffs of the third edition of the tournament. Dindigul Dragons and Siechem Madurai Panthers finished with 10 points each from five wins. Dragons were given pride of place on the basis of better Net Run Rate. Lyca Kovai Kings, iDream Karaikudi Kaalai, Jones Tuti Patriots and Ruby Trichy Warriors all finished with eights points from four wins each with the first two sneaking ahead in that order on better Net Run Rate. The winner of Qualifier 1 will directly move to the final to be played at the MA Chidambaram Stadium in Chennai on Sunday, Aug 12 (7.15 p.m.) while the loser of Qualifier 1 will meet the winner of the Eliminator in Qualifier 2 to be played at the NPR College ground on Friday, Aug 10 (7.15 p.m.), with the winner advancing to the final.